It was an idea Nick and Janelle Foligno had talked about many times before, specifically, the most meaningful way they could express their gratitude to the many who helped save the life of their now three-year-old daughter Milana. Milana, born in October of 2013, was diagnosed with a congenital heart defect before she was even a month old. 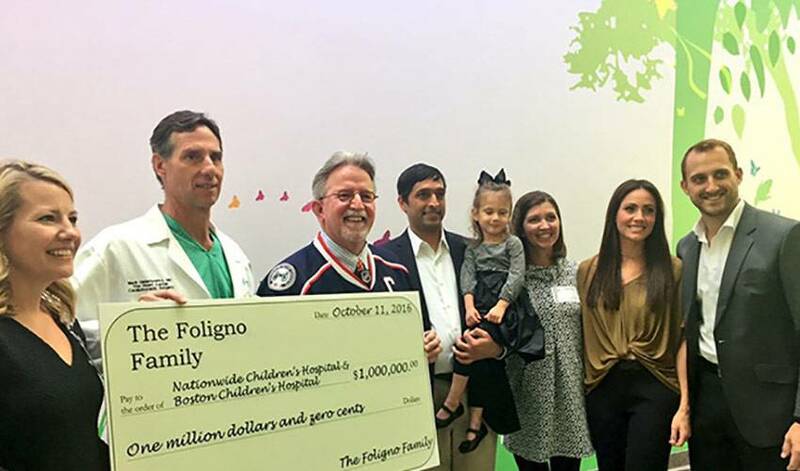 The Folignos looked to pediatric heart specialists at Nationwide Children’s Hospital (Columbus) and Boston Children’s Hospital to tend to their daughter’s life-threatening condition. Less than a week ago, Nick and Janelle presented each hospital with a cheque for $500,000, in a ceremony inside Nationwide Children’s Hospital, home to the newly named Foligno Family Cardiovascular Research Lab. Knowing that children and families will benefit from the donation holds great significance to Nick and Janelle. It’s had a profound effect on the man who wears the captain’s ‘C’ on his Columbus Blue Jackets jersey. “I think she's inspired me to slow down in life and enjoy everything again,” said Nick. “Sometimes in this life of hockey, it can fly by from game to game and is obviously very competitive and stressful. Over the past three years, the couple has lost count of how many times they’ve said, ‘Thank you,’ to those who played a part in saving their daughter’s life. On the day of their donation, they spoke those very words again. So, too, is Nick, who wanted to acknowledge the backing he continues to receive from those he plays with and against throughout the NHL season. One thing, among many, the Folignos reflected upon on October 14, Milana’s third birthday.